The knighthood of Star Wars is neither Galactic nor an Order. The first time we ever see the power of the "light side" of the Force is to psychically dominate a security guard. The first time we see a lightsaber in use, it's to maim someone in a bar brawl. It's the "elegant weapon" of a man so feared that his battle cry sends the local people scattering. Small wonder, given that his apprentice slaughtered those same people indiscriminately and without repercussion. This man, Obi-Wan Kenobi, pines for a time when he and his brothers roamed the galaxy, meting out their unaccountable rulings as emotionless judges and executioners— when not using their powers to cheat at dice. "A more civilized age" indeed. In the Star Wars films, the Jedi Order and their Galactic Republic are an undemocratic, ineffective government maintained by a combination of religious awe and martial force. Nobody elected their Council - they noisily resent any outside input at all - yet each member of their entire order is a roving diplomat plenipotentiary, general, judge, and executioner. Their members are spirited away as toddlers, promised that they are chosen by a higher, ineffable power, and trained to act without emotion while training them in personal combat and the ability to telepathically manipulate "the weak-minded". They are trusted despite the fact that this power can corrupt - not only in the traditional way, but in a metaphysical one, transforming these unemotional, unaccountable warlord-judges into monstrous super-powered spree killers. Even when that power does corrupt - when Anakin Skywalker turns to mass murder - he isn't even so much as censured, let alone removed from the Council and brought to justice. Despite this, the Jedi Order is the only semblance of order in the Republic as a whole. The Galactic Republic isn't a republic. Its leaders aren't elected, it isn't founded in principles of liberty or decency or freedom. It's barely a functioning government at all. It's a loose federation of states, with a gridlocked Senate whose only apparent function is mediating among them. That's not a government, though. They have no power over their constitutent states, and can't even seem to enforce the few regulations they manage to pass. Their only military is the order of itinerant warrior-monk-executioners, until their army of compliant clone slaves. And slaves they are. They are bred to follow orders without question, serving at the whim of the Jedi but exterminating them at an order. Chattel slavery is common in the Republic, though. The Jedi only seem to protest chattel slavery of humans when it inconveniences them personally, and themselves casually keep mechanical sentients - who are indistinguishable from organic people except in appearance and function - as both personal assistants and personal possessions. C3PO and R2D2 are no less self-aware or intelligent than anyone else, but they and all other droids are property that can be sold, destroyed, or even mind-wiped at the whim of their owners. Even if the Republic has high-minded ideals that aren't apparent, they don't matter. In practice, the Republic is a collection of fiefdoms ruled by local warlords, oligarchs, and plutocrats. They have personal militaries, rule unquestioned in their own territory, and wage cabinet wars against each other over. We never meet a Senator or local ruler that isn't a royal scion, CEO-ruler, or slaver. We have no indication that even the most benign-appearing rulers are benign save their own word: the only inhabitant of Cloud City that works for Lando Calrissian is a cyborg with an implant that makes him entirely subservient, the only policy we see Amidala's government execute is isolating and marginalizing the Gungans. The Rebellion that seeks to restore that republic that preceded it doesn't appear to be just, either. Its heroes all seek to aggrandize themselves rather than liberate - or even help! - anyone but themselves. They are less "rebels" and more royalists, revanchists, and criminals. Obi-Wan controls the minds of police and maims people in bar fights. Han Solo is a drug smuggler who works for a slave-keeping warlord. Lando Calrissian is a double-crossing womanizer and slave-owner - and why does he have a dungeon exactly like Jabba the Hutt's, complete with torture chamber? Luke Skywalker is a would-be Jedi who learns powers he never turns to any end but killing and destruction. And Princess Leia lies, constantly. Leia is an excellent liar. She maintains her stories even under torture. She's so accustomed to lying that she is dishonest with herself and Han Solo about her feelings towards him for a very long time. She puts this talent for lying to excellent use as a turncoat spy. Leia abuses her diplomatic immunity to undermine the government she serves. She lies about the nature and success of her mission to protect her objectives. She lies when questioned about the location of the Rebel military. So why do believe what she has to say about Alderaan? The signature brutal outrage of the Empire is destroying Alderaan, a "peaceful planet". But we know nothing about Alderaan except for the word of a traitor desparate to save her home - and retain her crown. Even if she isn't lying, those Rebellion uniforms, rations, and transports are coming from factories somewhere, and not abandoned Dantooine nor all-but-uninhabitable Hoth. Leia has just helped the Rebels in their plan to destroy the a moon-sized installation and kill everyone on board - not occupy it to take the governor and his subordinates there into custody. Technicians, staff, and independent contractors are fair game for these left-wing militants. Destroying Alderaan is retaliation in kind - excessive, but an act of war. This doesn't make the Empire heroic. It's certainly no benevolent liberal empire. It is a brutal dictatorship that rules through force and fear, while replicating many of the Republic's excesses, like droid slavery. But it is a functioning government. It replaces the Republic's federation of warring nation-states with local regional governors who must answer to a central authority. Their military and police are composed of thinking, feeling people, answering to a chain of command. Their officers are trained to dislike the arbitrary, brutal "justice" of roving bounty hunters. On the ground, the only time we see the Empire rule is when their military police bring a semblence of law and order to Mos Eisley, an infamous "wretched hive of scum and villainy". Where the Empire doesn't rule, life is clearly not very pleasant, as rule defaults to the richest or most violent. The Star Wars universe we see in the films is a dystopia. A corrupt, decadent Republic and its Jedi street judges whose dispassionate brutality would shock Mega-City One are replaced by an equally brutal - but at least functional - dictatorial Empire, which is in turn overthrown by revanchist militants. It doesn't make any sense why anyone might root for any of its "heroes"; their motivations and actions certainly aren't heroic. Star Wars doesn't happen in a universe, though. It happens in "a galaxy far, far away". The brave heroes struggle against the Empire and its cruel, fascist enforcers - or against the inevitability of the corruption of the noble Republic and the formation of that Empire. The weapons of war are laser swords and space magic and one of the main characters is a guy in a gorilla costume. Four decades of fans pondering the logistics and "canon" of this fantasy - and the industry built around the Star Wars "expanded universe" that attempts to show what the films tell and reconcile their inconsistencies - miss that Star Wars is a fantasy story, focused on making emotional and symbolic sense. To turn Star Wars into a canon strangles all of the things that make it a fairy tale. "The Hobbit: How the 'clomping foot of nerdism' destroyed Tolkien's dream - and the fantasy genre", by Laurence Dodds in the Telegraph. How turning stories into canon leads to creative bankruptcy. 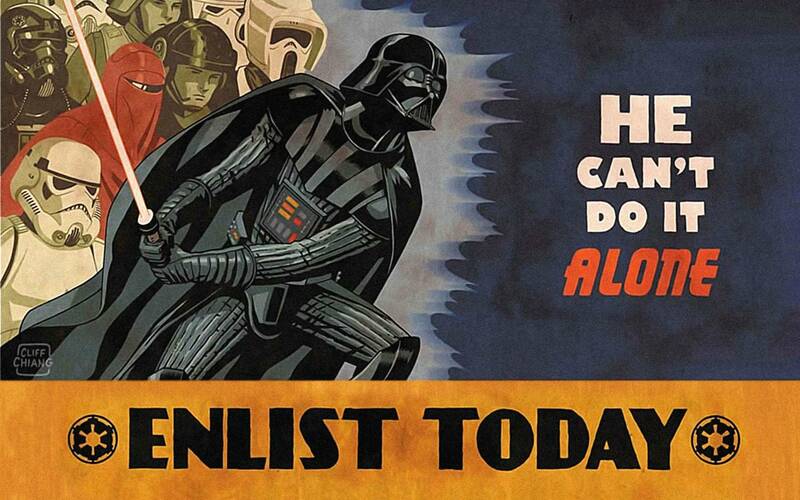 "Why Conservatives Love the Galactic Empire", by Asawin Suebsaeng in Daily Beast. On why journalists love to argue about the politics of make-believe space genocide on Twitter. "The Destruction of Alderaan Was Completely Justified", by Sonny Bunch for Washington Post. Why the destruction of Alderaan was completely in keeping with neoconservative principles. "very afraid", by science fiction author M. John Harrison. On the tension between storytelling and worldbuilding, and the importance of the former.